Home Uncategorized Deep State Does America—BIG TIME! 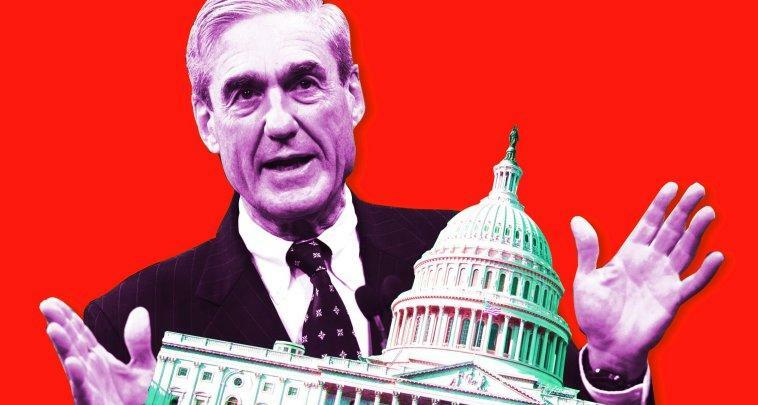 Primo agent of Deep State Robert Mueller was handpicked by DOJ plant Rod Rosenstein to manufacture a criminal case against President Trump the likes of which the Democrat leadership is actually guilty of. Here’s the deal. First you have Senator Jeff Sessions lavishing praise on Trump during the campaign to curry favor as a means of being appointed Attorney General—the single most important post in federal government. Trump falls for the ruse not knowing that SES Sessions is a diehard Bush Dynasty stalwart. The $64,000 question here is what does Deep State have on Sessions that he was coerced into deceiving Trump at the outset of the campaign. And, how was he compelled to permit the appointment of a totally conflicted and corrupt Special Counsel—Robert Mueller. Before that, you had FBI Director James Comey corrupting the entire Hillary investigation process. And his criminal contempt for law enforcement process and procedure was abetted by Attorney General Loretta Lynch no less. All the while you have Deep State putting DOJ and FBI personnel into the perfect positions to conduct flawed investigations of the Trump campaign in order to falsely prosecute President Trump and his associates. Andrew McCabe, Peter Strzok, Lisa Page, and Bruce Ohr are only a few of those Deep State operatives. 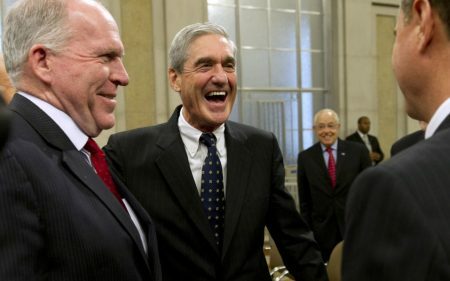 Then you have Robert Mueller being appointed Special Counsel by primo agent of Deep State Rod Rosenstein. This was the coup de grâce of the seditious scheme to execute a soft coup. Deep State has Trump exactly where they want him. They believe that the POTUS now sits between a rock and a hard place with not a whit of wiggle room. If they’re wrong, however, they will all find themselves in deep doo-doo. For those who are blissfully unaware, the United States of America is not only in the midst of an unparalleled and full-blown constitutional crisis, we are at war. This war has taken the form of both a revolution and a civil war. Strange as it may sound, there are actually two revolutions taking place at once. • First, there is the Purple Revolution that was officially launched the day that Donald Trump was elected POTUS. This highly organized seditious movement financed by George Soros and led from behind by Barack Obama and fomented by Hillary Clinton was spearheaded by various and sundry agents of Deep State. The primary agents were former directors within the U.S. Intelligence Community. Their insurgents come from the Left and especially the extreme left wing of the Democratic Party. Countless liberals and progressives alike found among their ranks who all share one thing in common—they hate Donald Trump and do not want to MAGA. • Secondly, there is the ongoing Second American Revolution that began in 2016. That revolution also unofficially began in 2016 the Chinese Year of the Fire Monkey, the same year as the first American Revolution. This movement of patriots is populated by folks mostly on the political Right as a reaction to the Obamanation. These Conservatives and Christians, Tea Partiers and Libertarians, traditional Republicans and Independents have all assembled under one tent as nationalists who have taken on the globalists. They detested the leadership of Obama as much as the Never Trumpers dislike the POTUS. • Then there is the civil war taking place in the midst of this chaotic political battlefield. That war is a nationwide social conflict marked by pitched battles in cities and violent skirmishes in rural counties across the USA that pits the social conservatives against the cultural marxists. This civil war actually began well before Trump and Obama but is coming to a deafening crescendo with each passing year of the Trump presidency. Both sides of this war for the heart and soul of America are getting closer to taking no prisoners because of what is at stake for each. Both Trump and Obama do represent the spearheads of their respective movements although the 44th president seems to have wimped out lately. Exactly where does Russiagate fit in to all of this? Russiagate is Deep State’s secret weapon. It’s a highly destructive and deadly weapon that was manufactured during the Obama years and then perfected once Trump entered the Oval Office. There is no better way for Deep State to accomplish so many USA-destroying objectives than with this extremely absurd and stealthily concocted hoax. After Trump took up residence at the White House, the Left literally went insane. For various reasons, all the Democrat leaders coalesced around their stated necessity of removing Trump from office expeditiously. Hence, the ludicrous Russiagate conspiracy was conceived as those who incited it went on a perpetual prescription of ultra-potent political steroids…which is what they’re still taking today. They take these pills with CNN kool-aid and NBC-brewed firewater. What the nation is now experiencing is not just the crazies running the asylum; rather, the craziest among US are shouting “FIRE!” at the top of their lungs while they themselves start wildfires everywhere they can to produce the smoke that is then blamed on their political enemies. Did you get that? These faux Russiagate arsonists have done everything in their power to inflame the whole country around a scandal that never took place. Not only is that the real scandal, but it’s also covering up their own crime spree that includes treason, genocide, crimes against humanity, grand theft, government overthrows, ritual child sexual abuse, and much more. This is precisely why the controllers chose Robert Mueller as Special Counsel. The guy is — by far — the dirtiest cop in America. This is the same guy who was purposefully installed as FBI Director just 7 days before the terrorist attacks on September 11, 2001. Mueller’s mission of destroying Trump by fabricating a false case against him is wholly consistent with his professional career. In a word, he’s Washington’s primary fixer, just as James B. Comey became after his ascension to the FBI directorship. If there is outright collusion to commit treason and other high crimes, it is the Department of Justice and Federal Bureau of Investigation that are obviously guilty as sin. These two supposed pillars of American law enforcement engaged in conduct that is nothing less than sedition. The highest leaders of both conspired to fix a U.S. presidential election and then launched a full-scale coup d’état when they were unsuccessful. The makings of this soft coup go back to the Loretta Lynch and James Comey days. That’s why both were appointed to their positions: they were both representative of the utter lawlessness exhibited by the thoroughly corrupt and criminal Obama administration. Quite surprisingly, even AG Jeff Sessions has been irreversibly compromised since he took office. Surrounded by the likes of Deep State operative Rod Rosenstein, Andrew McCabe, Peter Strzok, Bruce Ohr and many other corrupt officials, Sessions quickly became a part of the swamp he was supposed to drain. Sessions was actually set up to recuse himself from the very beginning. Whether he knew from the very beginning that he would betray Trump cannot be stated with certainty. However, looking at his official conduct from day one, everything points to the likelihood that Deep State used his SES classification to recruit him. His close affiliation to the Bush family also points to the great likelihood that Sessions was sent into the Trump campaign as a Trojan horse. Which is exactly how he has performed. In other words, Sessions is the worst kind of traitor who presented himself as a friend but was really a treacherous enemy. It’s of paramount importance to understand that this ongoing insurrection by stealth would never have gotten off the ground were it not for key members of the U.S. Intelligence Community. They threw their weight behind Hillary Clinton at the start of the 2016 election cycle (How many times did Hillary tell the American people that 17 intelligence agencies corroborated Russian interference in the election?). Never in American history has the intel community outwardly interfered in a U.S. presidential election. Not only that but they acted as though they had complete impunity in the conduct of illicit spying and surveillance against Trump’s campaign officials. This unprecedented criminal conspiracy to fix an election was even coordinated with the British Intelligence Community who was actually calling the shots. How’s that for a real “James Bond” thriller?! What we really have here is an “Unprecedented Constitutional Crisis” of truly epic proportions. However, what the American people are seeing is only a tip of the Deep State iceberg. The true state of affairs is now so dire that it will have to come to a head one way or another. The body politic has witnessed things over the past two years that have never been seen or heard in the nation’s history. And it only gets worse by the day. Let’s face it: when a POTUS comes right out and says that the media is the enemy of the people, society cannot continue as it is. Because Trump tells this raw truth time and again, he reminds the American people that the media cannot be trusted in any way. THE MAINSTREAM MEDIA IS THE ENEMY OF THE PEOPLE! Furthermore, that the CIA, FBI, DOJ, NSA, and many other alphabet soup agencies are also fundamentally untrustworthy as well as very dangerous to the Republic says that we are experiencing “The Biggest Scandal and Broadest Conspiracy in U.S. History”. Fabricating a story like the “Trump-Russia collusion” is the worst sort of crime. That this Democrat Deep State crime wave can literally lead to World War III makes it all the more egregious and reprehensible. The Obamas, the Clintons, the Podestas, Biden, Schiff, Schumer, Blumenthal, Pelosi, Waters, Brennan, Clapper, Hayden, Mueller, Comey, Lynch, McCabe, Strzok, Rice, Sessions et al. are all warmongers and traitors of the highest order. Each of them has willfully participated in this ongoing coup d’état and needs to be arrested for treason and prosecuted to the fullest extent of the law.